(Newser) – Tragedy in Antarctica: Two technicians are dead after an unexplained accident at an American research station, the National Science Foundation says. 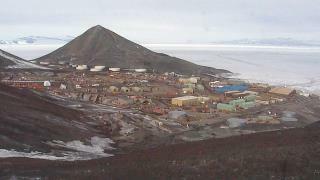 The NSF says the two men had been working on a fire-suppression system for a McMurdo Station building that houses a generator for a radio transmitter, Reuters reports. They were found unconscious by a helicopter pilot who landed to investigate after spotting smoke coming from the building. Both men were taken from the building and given CPR. One was pronounced dead at the scene and the other was pronounced dead after being flown to a medical clinic, authorities say. Remember the movie ''The Thing'' hmmmmm. >> doing preventative maintenance on the building. Preventative. I HATE that word. If you're going to use "preventative" instead of PREVENTIVE, why not add a few other suffixes? Prevetativatatious? Preventativatacioucizeish? A few years ago, Little Orphan Annie had a run of strips that dealt with mysterious deaths & fires at an Antarctic Base. That fire was spotted from the air, too.